The Ruby Mountains jut out of the Great Basin just to the south east of Elko, anyone who has ever driven across Nevada from Utah to California, or vice-versa has undoubtedly noticed the range. Although Nevada is surrounded by other states that are famous for their skiing, The Silver State has never really gained famed for it’s winter recreation- undeservedly so. With a little exploration, and imagination, great lines can be found that are comparable to most of the stuff you’d find in the Wasatch, Sawtooth’s or Sierra. Joe Royer has been running a hell-ski operation out of Lamoille, NV at the foot of the Ruby’s for 37 years. The base of operations is out of a beautiful property called Red’s Ranch, that has comfortable beds, a wonderful atmosphere, and amazing food that is prepared by Joe’s wife Francy. 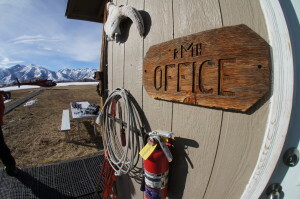 The helicopter sits out in a field adjacent to the ranch, and the mountains are on the doorstep. 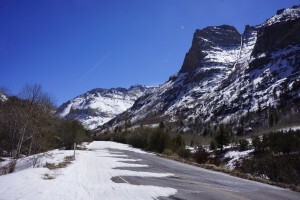 While the range appears mesmerizing when driving by at 80 miles an hour on I-80, and closer inspection reveals that the range can be intimidating with few trailheads, a lack of easy access, non-existent guidebooks, and scant beta- a little exploration will open the range to the uninitiated. Of course the best way to access the Ruby’s is from a seat of Royer’s A-Star helicopter, which has several landing zones in the upper elevations of the range, including all the way to the tops of the highest peaks, which approach 11,400 feet. From here the range is stupendous, with couloirs and bowls flanking off in every direction. 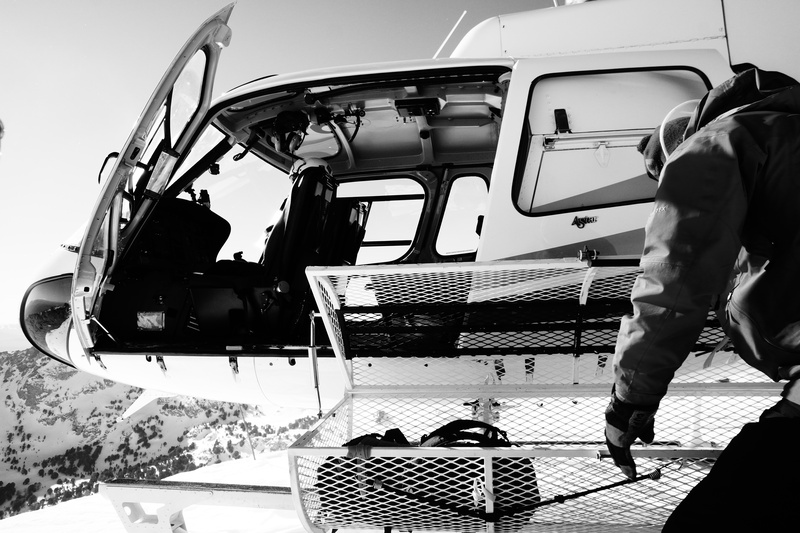 3000 foot descents are commonplace, and the ski traffic in non-existent other than the guests of the heli outfit. I’ve been going to the Rubys for 4 years now; skiing one day with Royer’s team, and then taking an additional day to do some touring. 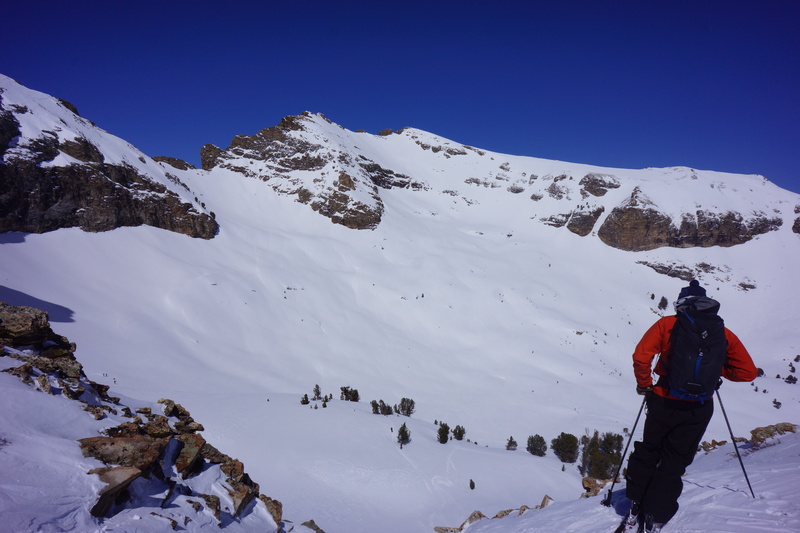 The guides are great and friendly, as everyone at the ranch is, and are willing to share their snowpack observations, winter history, and suggested lines. The guides come from all over, but a good number of them can claim some ties to Snowbird, as Royer can as well- his skiing prowess and early descents in the Wasatch are legendary. The A-Star is a comfortable ship that holds 4 skiers, a guide, and the pilot- and accesses the tight ridges and summits with ease. This year we had 4 groups shuttling on the day, a crisp day with a variety of snow conditions. 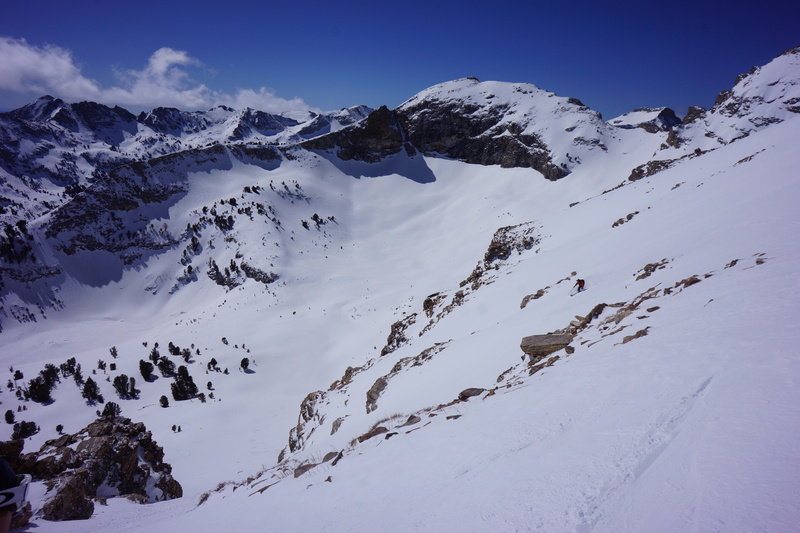 We experienced creamy powder, solid crusts, wind scoured ice, graupel, smooth chalk, and after lunch on the south and east faces- perfect corn. After lunch, the groups were whittled down to two teams, and all told we made over 21,000 feet for the day on 8 lifts. Our team was strong skiers with experience from Tahoe, the Wasatch, and the Pacific Northwest. After 4 years, I certainly have only scratched the surface, and am still awaiting to get to some of the bigger lines, several of which present themselves from the summits. The views to the south and north are astounding as the terrain reveals itself, and access as mentioned before would be quite a slog if done on foot only. 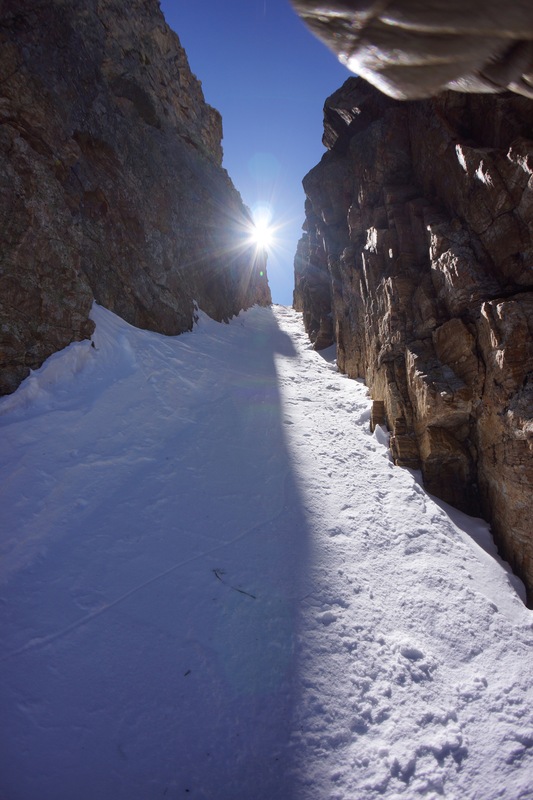 The most famous line has become the Terminal Cancer Couloir, an impossible looking hallway that cuts through a solid rock monolith, and appears almost impossible when viewed from a distance. 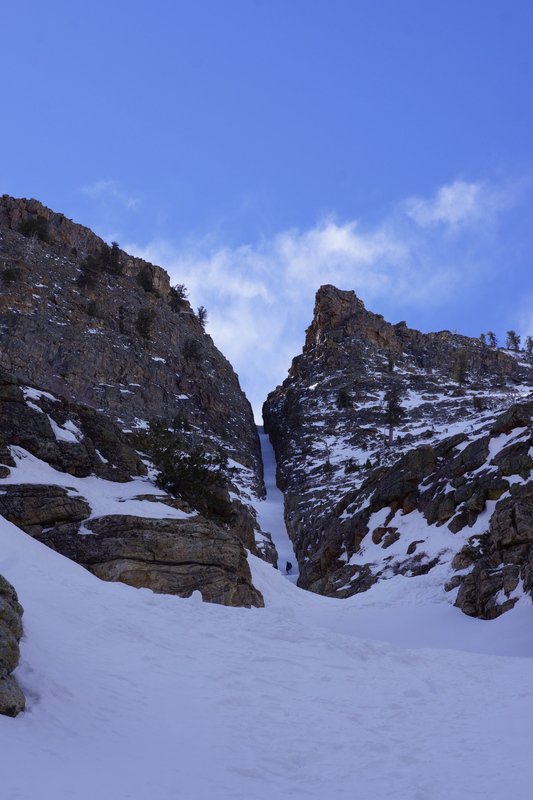 Popularized in the recent “Fifty Classic Ski Descents of North America” (Davenport, et al.) the Terminal Cancer was first skied by Royer many years ago. Today, it is a desired tick for almost any backcountry skier. One of the most appealing aspects of the chute, is it ease of accessibility. 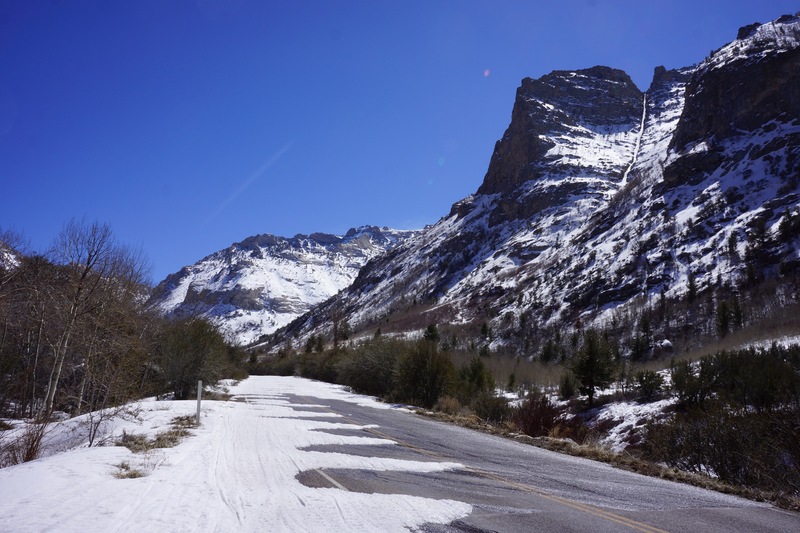 Located a few miles up the main road of Lamoille Canyon, the the spring when the road has melted out, it’s possible to drive very close to the bottom, from a half mile walk to right to the bottom of the chute. A crossing of the creek, and your on your way up- the route is simple. Rising for nearly 2000 vertical feet, and anywhere from 15-20 feet wide, the slope ranges between 35-45 degrees. I was surprised to encounter two others in the couloir on a sunny Wednesday morning, they were there for the first time, coming from CA to ski the Terminal Cancer exclusively. It was a hard, crusty and icy descent for them, but they were thrilled nonetheless. Terminal Cancer- close to the road. I made the top after about an hour and a half of climbing, and enjoyed the bright sunshine. The winded had picked up, and had begun some deposition in the upper parts of the chute, which were certainly bony. 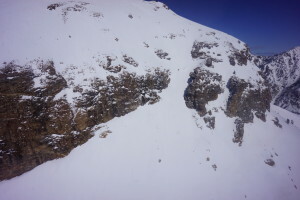 As I began to make my descent, tighter turns yielded to…tighter turns..the wind deposited snow began to migrate down as I skied, resulting in a soft surface with a chalky subsurface for smooth turning. It’s a fun descent, and you really get to appreciate the walls as they loom above you, there is no exit until the bottom. Soon enough it’s over, and possible to ski right down to the creek bottom. From there it’s an easy walk back to your car. Total round trip was around 3 hours. I would have enjoyed staying a few more days as always to explore some of the side canyons as well as the upper canyon via walking, and as I returned to my vehicle, a few fellows with snowmobiles were just heading up, inquired about conditions, and asked if I needed a lift anywhere. I’d been on the road for a week, and promised to be back home that evening. My time was over, and had to give a regretful decline. Next time to explore some of the magic of the Silver State. March 25, 2014 in Ski.